18" finished circumference, stretches to fit a 22" head. I was part of a gift exchange at work and needed an impressive yet quick knit for my swap partner the name generator popped out for me. 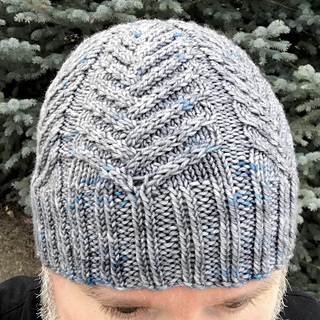 I started making quick cable pattern from a sweater and it turned out dreadfully wrong. Evidently, cabling while watching TV was a mistake. One happy cabling mistake, three color changes later after finding his color preferences, this was the ultimate result. 18” Finished circumference, stretches to fit a 22” head. 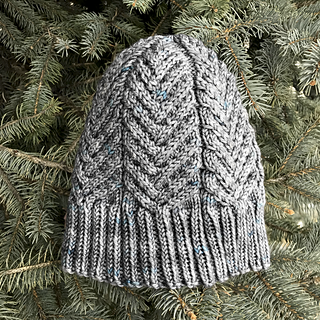 Hat is to be worn with negative ease so the cables pop. About an inch or two will comfortably do it for most heads. US 4 (3.5 mm) dpns or 16” circular needle or size require do obtain gauge.